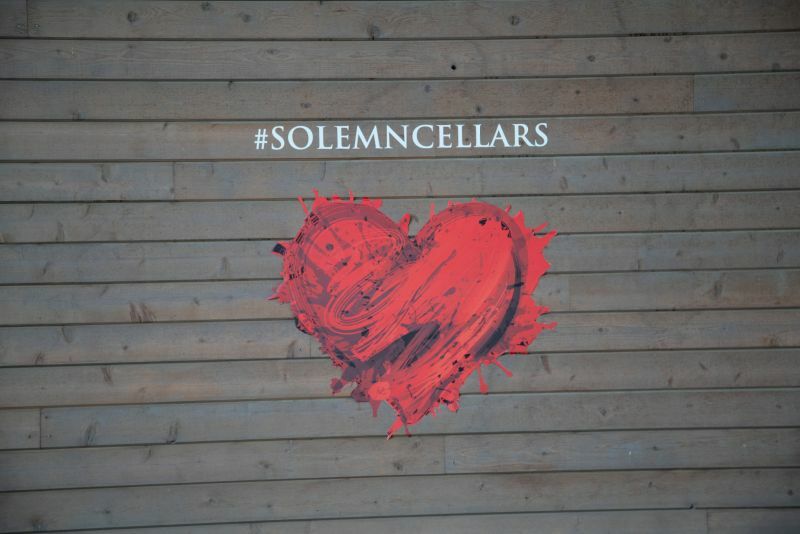 We finished our post Wine Bloggers Conference excursion with a visit to Solemn Cellars. Justin Basel is the owner and winemaker. He has been making wines since 2001, although only in the current facility since August of 2017. Justin grew up in the Walla Walla Valley and has seen the town change; with an influx of restaurants and tasting rooms. Moreover, the crops grown have shifted from wheat. peas, and alfalfa to grapes. 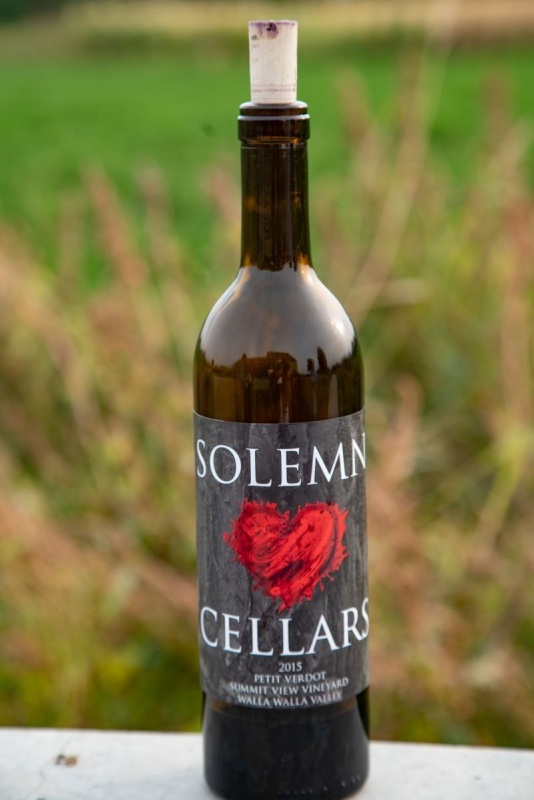 Solemn Cellars focuses on making wines with a single grape, from a single block, in a single vineyard. I asked Justin why he had selected the name Solemn for his winery. Since after even a few minutes talking with him, it was clear that he is lively and outgoing. He was pretty much the antithesis of solemn. He explained that the name reflected the seriousness he has for the industry. To quote their website: “The definition of ‘Solemn’ is formal and dignified, characterized by deep sincerity. 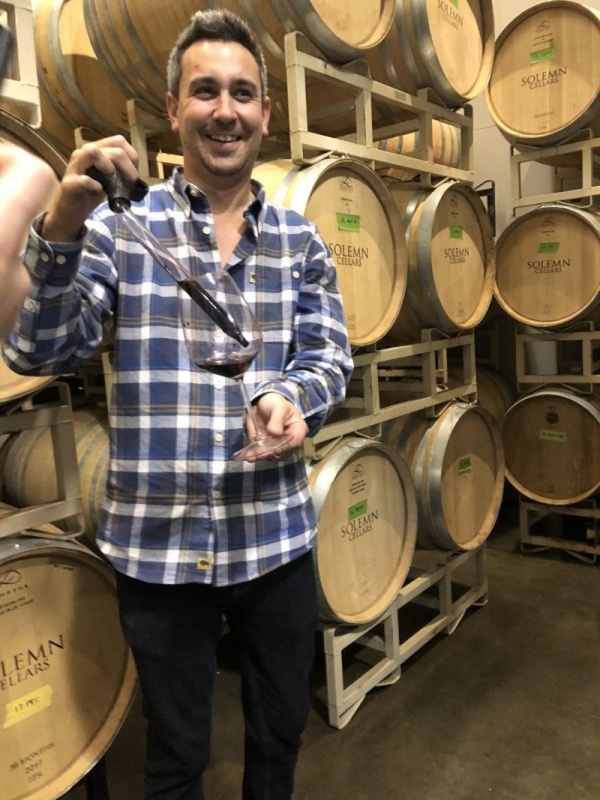 This is exactly what Justin and Brianne Basel set out to represent when forming Solemn Cellars.” Further evidence of that focus can be found in the relatively small production of 1800 cases a year. We took our tasting outside, which was comfortable even on a crisp October afternoon, by a fire pit. Justin poured the tastes into large glasses, ideal for swirling, smelling, and sniffing. Justin provided a plate of meat and crackers to help clear the palate. 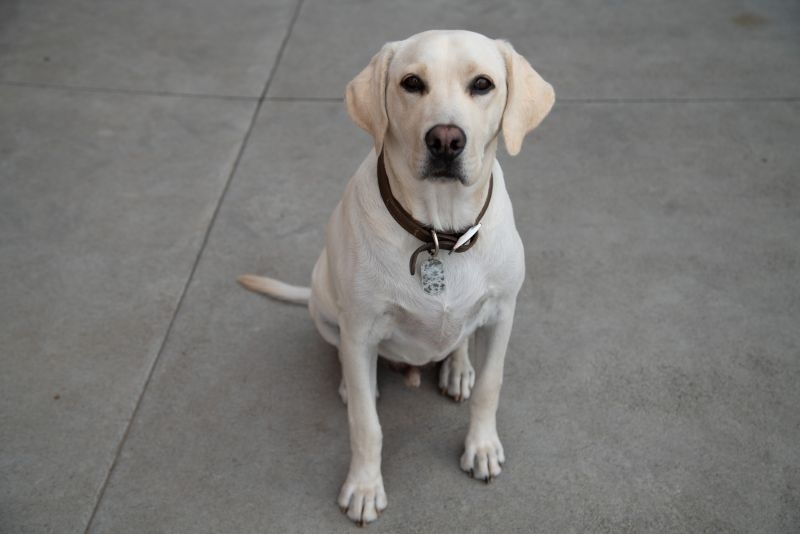 Although, our focus was on the wine the winery dog had other interests. Whoever was taking a bite from the plate became a canine best friend. The dog watching them with a pleading gaze until the food was consumed. We started our tasting with the 2015 Malbec. Fruit for this $42 wine was grown in the Summit View Valley. That vineyard sits on the Oregon side of the valley. The nose was rich and deep; offering notes of cherry and warm leather. On taking a sip, the immediate impression was soft and spicy. There were flavours of plum, raspberry, and black pepper. Tannins emerged in the long finish that was shared with the fruit. Next up was the Solemn Cellars Sangiovese ($42). The nose was light and fresh with aromas of ripe plum. It was when we took a sip that this wine came into its own, with a velvet mouthfeel. It exhibited good acidity, notes of cherry, and a tang of vanilla. Dusty tannins supported these flavours. Amber is a lover of this varietal and this one received her seal of approval. Moreover, we purchased three bottles. The third wine that we tasted by the flames of the fire pit was the 2015 Petit Verdot ($42). Baking spices, a touch of menthol and a hint of cherry infused the intense nose. In the mouth, the wine was acid forward with a rich taste of sour cherry. This was a wine of real character and contrast. Justin poured the next two wines side-by-side. The purpose was to show the difference that climate makes. Both of these wines were made with the same clone of Cabernet Sauvignon. The grapes for both wines grew in Pheasant Run Vineyard. Moreover, Justin used the same barrel treatment for both releases. In contrast, the grapes grew at different altitudes. 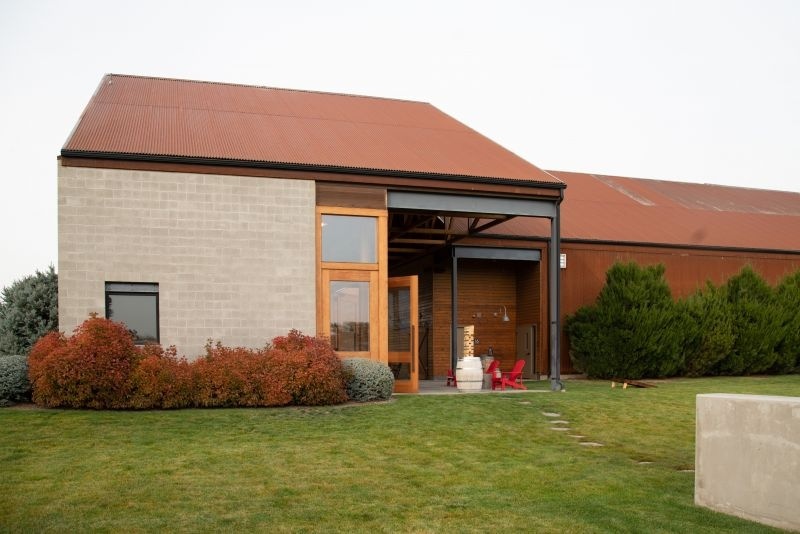 In Walla Walla, higher vineyards are warmer than those closer to the valley floor. The 2014 Walla Walla Cabernet is made with grapes from Block 3 of the vineyard. The 2015 Block 2 Cabernet uses grapes from the eponymous block which sits higher than Block 3. In the evening cold air rolls across the valley floor. This results in a temperature difference between the two blocks. The nose of the cooler climate Cab offered leather, green pepper, and mint. In contrast, the Block 2 Cab was intense and laden with fruit. The Walla Walla Cabernet exhibited a bright and higher acidity than its counterpart. In contrast, Block 2 had far richer fruit flavours. On balance, I preferred the latter wine. Justin makes a third wine from Cabernet Sauvignon. Unusually, for this grape, it is a rosé wine. A further twist is that he uses Syrah skins to soften the wine and deepen the colour. Justin then took us into the barrel room. He explained that he uses just three coopers. About 80% of the barrels are made from French oak; the rest are American oak. Once in the barrel room, Justin took Syrah from a couple of barrels. The purpose of the exercise was for us to compare Syrah from two vineyards. The first of these wines were from the Pheasant Run vineyard; the source of the two Cabernet we had tasted outside. The second wine was made with fruit from a vineyard in The Rocks. The first Syrah had a stunning nose of ripe plum and oak. The taste was of plum and cherry. The rich fruit served against a bed of dusty tannins. In contrast, the Rocks Syrah had a nose of burning tires, rotting vegetation, and leather. The funky taste reflected those aromas: leather, a little sour cherry, and oak becoming noticeable in the finish. In this wine, the acidity popped. Once more, we tasted a Syrah from the Rocks that took on different characteristics from one made from elsewhere in the AVA. 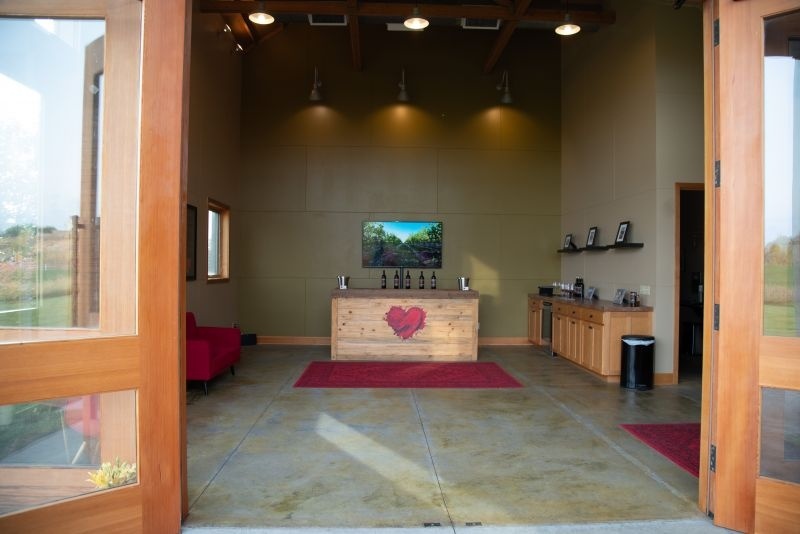 Solemn Cellars offers a simple, no-nonsense, tasting room. In addition, there is space to try the wines outside and the fire pit extends the season for al fresco sipping. Most importantly, Justin makes wines that highlight how good Walla Walla wine can be. 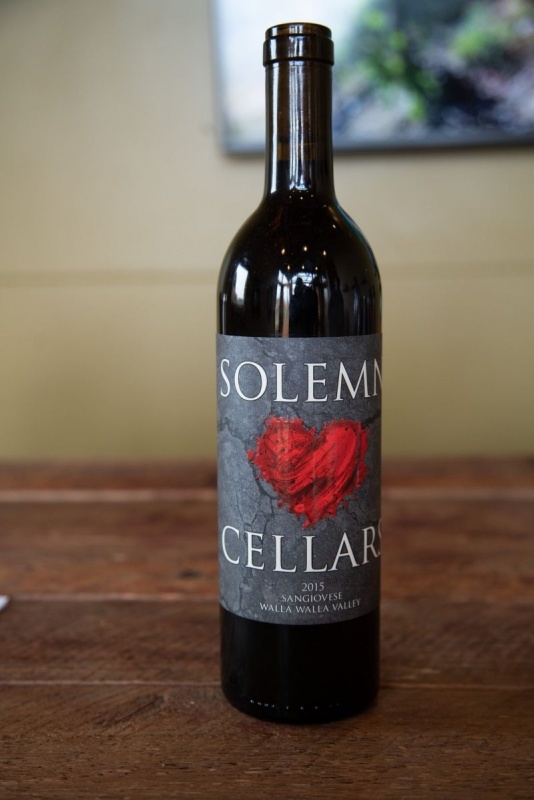 Disclaimer: Visit Walla Walla hosted us at Solemn Cellars.